Historically, space investing has been the exclusive domain of governments and billionaires, which has drastically impeded the flow of needed capital for frontier-enabling companies. SpaceFund believes this lack of investor appetite for space startups boils down to two fundamental problems: lack of information and lack of liquidity. SpaceFund has put together a team of experts to close the information gap, by producing and publishing data about the industry, and by acting as an intermediary for investors who know little about the industry. However, the industry’s lack of liquidity and long investment horizons provide a more difficult challenge for would-be space investors. This is where the advent of new digital financial technologies can help significantly increase liquidity by decreasing investment horizons and decoupling project timelines from investor exits. Meagan will discuss the thesis that created SpaceFund, show some of the company’s recent industry research, and explain how this new venture capital firm will help fund the permanent human settlement of space. 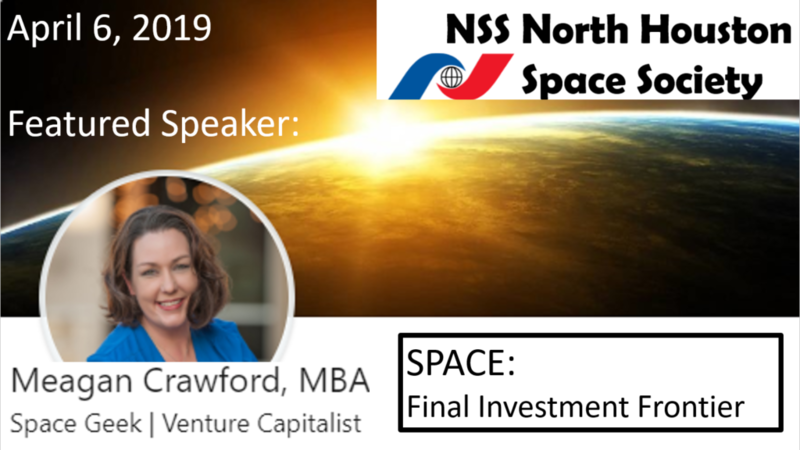 About the Speaker: Meagan Crawford is a NewSpace industry pioneer with a breadth of experience across finance, investing, management, entrepreneurship, communications, marketing, and team building. A strong believer in the power of free enterprise as the driving force that will lift humanity off-world, Meagan is dedicated to several projects focused on building a sustainable, profitable, successful space industry – for everyone. Meagan is a managing partner of the SpaceFund, a venture capital firm, created to bridge the two most important revolutions of this generation.